Research by Sonja Lyubomirsky, professor in the Department of Psychology at the University of California, Riverside, suggests that what we do and what we think are far more important than our life circumstances. "Fifty percent of individual differences in happiness are governed by genes, 10 percent by life circumstances, and the remaining 40 percent by what we do and how we think—that is, our intentional activities and strategies," writes Lyubomirsky. This research is incredibly inspiring to those of us who are committed to living lives to the fullest and to empowering others to do the same. In our book Positively Smarter: Science and Strategies for Increasing Happiness, Achievement, and Well-Being, we share the Focused Fifteen strategies that we have found to be effective in supporting higher levels of happiness. Researchers at Harvard are pioneering investigations into the influence of happiness on health and well-being. For example, children who are able to stay focused on a task and have a more positive outlook at age 7 report better general health and fewer illnesses 30 years later. Optimism cuts the risk of coronary heart disease by half! Learn more by visiting the link. The research indicates that happiness and, conversely, unhappiness have a direct association with physiological processes related to health and disease. Subjective well-being influences physiological processes underlying health and disease, which makes it predictive of such health conditions as higher risk of heart disease or recovery periods in the wake of an injury or disease. 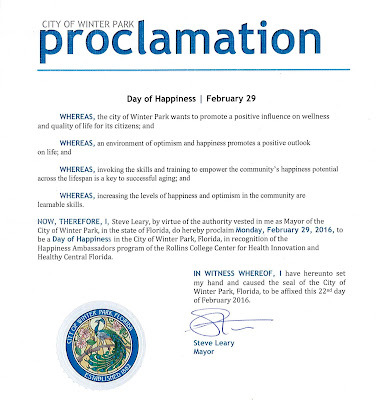 Happy to be Leading Happiness Ambassador Training in Winter Park, Fla.
Donna and I are thrilled to be starting a worldwide process for improving lives by applications of strategies for increasing subjective well-being in our Happiness Ambassador Training. The presentation is based on our best-selling book Positively Smarter: Science and Strategies for Increasing Happiness, Achievement and Well-being. 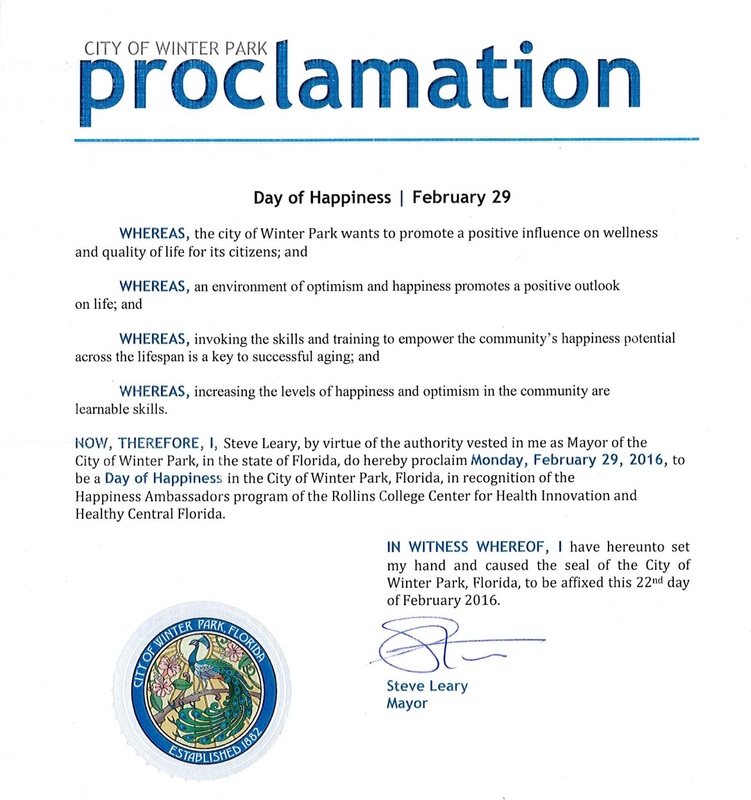 The response has been so positive that the city of Winter Park, Fla., has declared February 29 to be Happiness Day (see above proclamation). More than 100 volunteers will be attending the Happiness Ambassador Workshop at Rollins College in association with the Rollins College Center for Health Innovation and Healthy Central Florida. It’s an exciting time for mind, brain, and education research, with psychologists and neuroscientists regularly making discoveries that have revolutionized our understanding about people learn. For instance, we now know that academic achievement is greatly influenced by students’ ability to apply thought processes in a systematic way. We use the term metacognition to describe this ability, with the strategies that come into play known as cognitive assets. Cognitive psychologists and neuroscientists may use the term executive functions or skills to describe similar functions. For example, educators, psychologists and neuroscientists may all speak of the importance of capacities such as working memory, selective attention, and metacognition with regard to learning. All three groups of professionals are talking about skills that are linked to the brain’s prefrontal region, as well as other areas of the brain depending upon the specific skill. Ongoing research continues to increase our understanding about related structures and functions. Valentine’s Day is the holiday in which we consider matters of the heart. For the sake of our health, it’s important that we think about our hearts on the other days of the year as well. 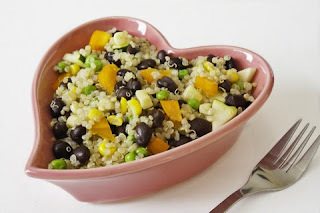 Putting the emphasis on cardiovascular health is essential to maintaining a healthy Body-Brain System, and maintaining a healthy Body-Brain System is the key to living a long and productive life of learning and doing all the things that we love to do most. Let’s Keep Positive Practical Learning Front of Mind in 2016! Global innovation strategist, Dr. Marcus Conyers is developer of the Innovating Minds® program for improving business performance by enhancing workplace environments and increasing creative and critical thinking skills. He is the founder InnovatingMinds.org and the developer of the world's first doctoral minor in Brain-Based Leadership and the first EdS degree in Instructional Leadership/Brain-Based Teaching (BrainSMART® Programs) in partnership with Nova Southeastern University, He is the co-author of 20 books in this field. Dr. Conyers serves as a subject supervisor for the PhD in Professional Practice: Psychological Perspectives at Canterbury Christ Church University. Founder and CEO of BrainSMART, he is an international keynote speaker who has reached more than 100,000 leaders and educators globally. Dr. Conyers has worked in 30 countries on 5 continents and presented to audiences including ministers of education in South Africa, the United Arab Emirates, and Ontario, Canada.